News — TOTAL JOINT ORTHOPEDICS, INC. Designed from the start to remove unnecessary steps, the Klassic® Knee System embodies the TJO ideal of Efficiency by Design™. Watch as Dr. Michael Morwood of the Hofmann Arthritis Institute showcases a 23 minute cementless TKA using the streamlined instrumentation made possible by this system. 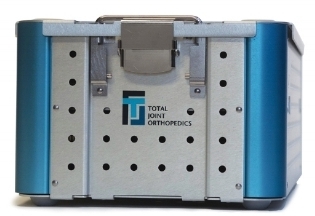 [Salt Lake City, Utah, May 15, 2018] Total Joint Orthopedics’ Klassic ONE™ tray system made its debut in New Orleans in March at the American Academy of Orthopaedic Surgeons. The system, which boasts a single tray for primary hip and knee replacement, was well received by surgeons and is highly anticipated by hospitals, surgery centers, and scrub techs alike. In a time of excess and waste, TJO remains dedicated to their cornerstone: Less is More®. The company, which currently offers three trays (far less than the competition) for hip and knee arthroplasty, has further streamlined the surgical process with an unprecedented single tray. Without sacrificing sizes or options, its intuitive, carefully designed instruments provide predictable, reproducible results. The system achieves the full efficiency of a single tray without the need for patient specific instrumentation, disposables, and additional imaging. It has already launched at Duke University, Durham, North Carolina, and White Fence Surgical Suites, New Albany, Ohio, and will continue to roll out to new sites throughout the year. To learn more about Klassic ONE™, please contact sales@tjoinc.com.